Two Youths Killed by Israeli Military, WARNING: Graphic Photos. | The Only Democracy? The Only Democracy? » On The Ground Reports » Two Youths Killed by Israeli Military, WARNING: Graphic Photos. Israeli Army Kills Youth Demonstrators in Iraq Burin Village Near Nablus. Mohammed Ibrahim Qaddous, 16, was shot dead with live ammunition when a Border Police force raided his village of Iraq Burin near Nablus to quash a demonstration this afternoon. Ussayed Qaddous, 19, who struck in the head with live ammunition and critically injured passed away in the Rafidya hospital in Nablus this morning. Mohammed was shot at 3pm this afternoon in the aftermath of a demonstration in the village of Iraq Burin protesting restrictions on access to their lands beneath the Jewish-only settlement of Har Brakha. He was shot in the back, indicating he could not have been posing any threat to the soldiers who shot him. 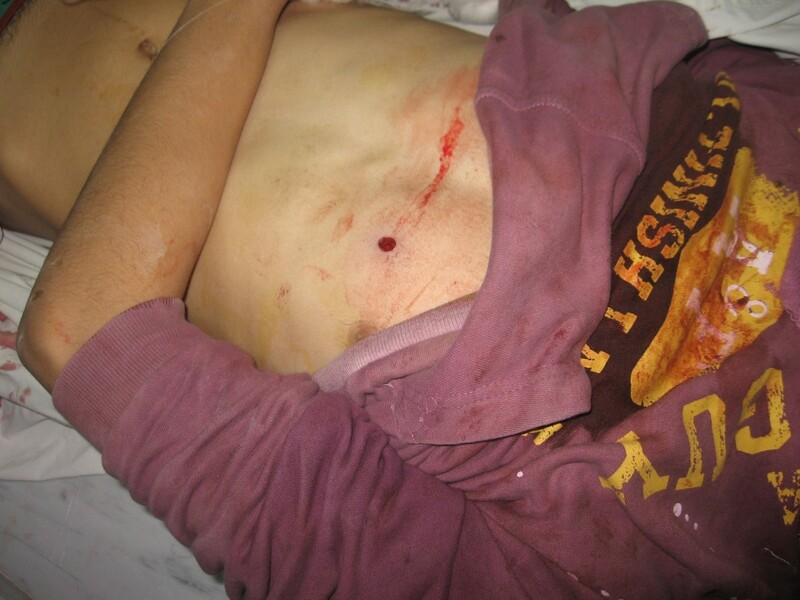 At the same time, Ussayed Jamal Abd elNasser, 16, was shot in the head with live ammunition and critically injured. Ussayed passed away at 4:30am this morning despite doctors’ efforts to save his life. According to eye witnesses both youth s shot with live ammunition as soldiers invaded his village after residents demonstrated to protest settler harassment and restrictions of access to their lands. The demonstrators set out towards the village’s lands after midday prayer, and were immediately confronted by soldiers who shot bursts of live ammunition in the air. They then continued to shoot tear-gas and rubber bullets towards the villagers in an attempt to prevent them from reaching their lands. Following the unprovoked attack on the villagers, who were accompanied by 15 international activists, intermittent clashes ensued. 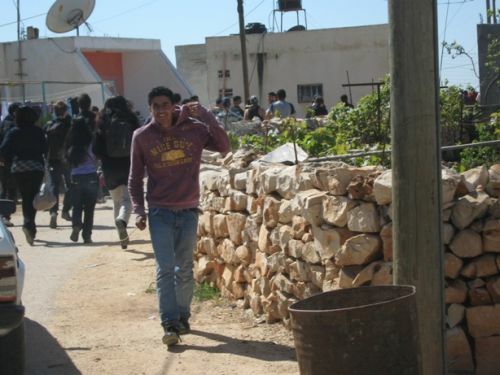 After about two hours, the Army retreated towards the settlement and demonstrators went back to the village. Shortly after, armored Border Police jeeps invaded the village, arrested three people and raided houses. A few minutes later, live shots were fired at a small group of young men, some of which were throwing stones. The shots resulted in the two fatalities. Despite the Israeli military’s claims that live ammunition was not used during the incident yesterday, the version given by numerous civilian eye witnesses of unjust use of live ammunition is corroborated by medical findings. 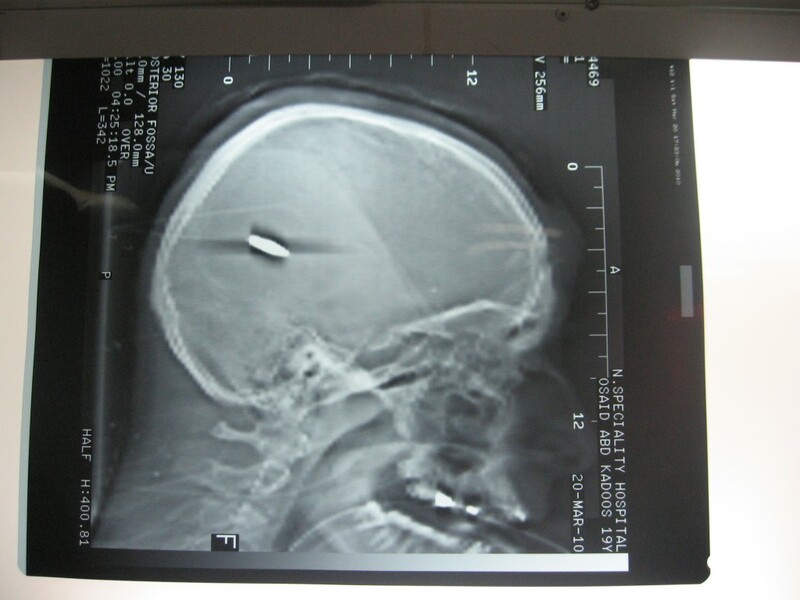 An Xray of Ussayed’s skull taken at the Rafidya hospital in Nublus shows what is clearly a live bullet lodged in his skull. 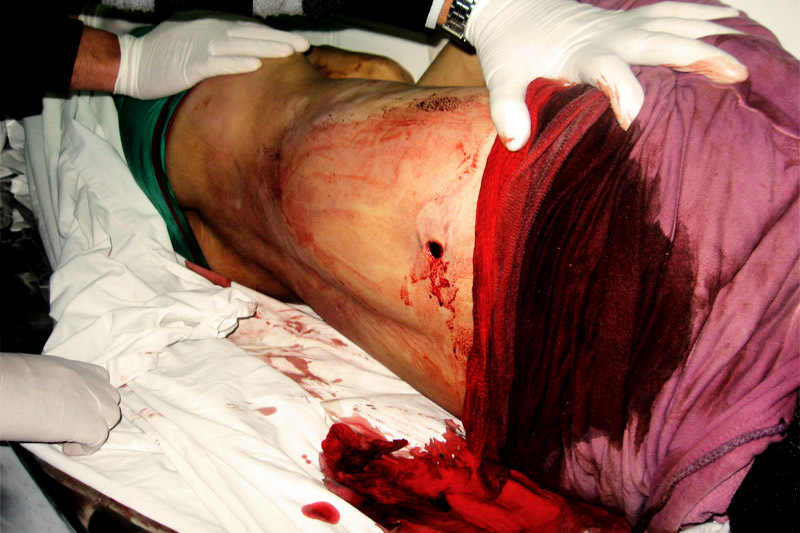 In addition, Mohammed’s body had an entry wound in the chest and an exit wound in the back. Such an injury could not have possibly been cause by anything but live ammunition. Less-lethal ammunition, rubber-coated bullets included, can, under no circumstances, cause such injuries, even if shot from point blank. Photo Quiz: Can you identify the military prison?